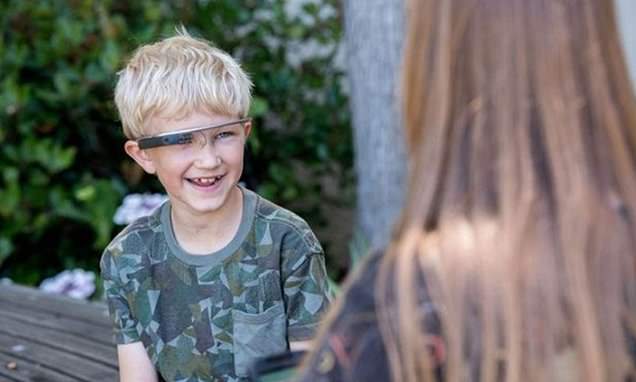 Google Glass can help children with autism understand facial expressions and social cues, a new study says. Children with the developmental disorder often have trouble holding eye contact and interpreting basic emotions, which can make it difficult to socialize. But researchers said wearing the so-called 'smart glasses', which include a screen and a speaker, helped kids better understand and identify the emotions on people's faces. In some cases, their autism symptoms were even slightly reduced. The team, from Stanford University in California, says its findings show that therapy via Google Glass is less expensive and easier to access, which could help improve wait-lists for behavioral therapists. Autism spectrum disorder (ASD) is a developmental disorder in which sufferers have a hard time communicating and with behavior. It encompasses several conditions - including autism, Asperger's syndrome and childhood disintegrative disorder - and symptoms can range from mild to severe. The intervention, named Superpower Glass by Stanford researchers, has autistic children wear Google Glass a few times a week. The wearable computer glasses are paired with a smartphone and feature a camera that records the user's point of view. Google Glass also has a small screen above the right eye and a speaker, which gives users visual and audio information. For the study, published in JAMA Pediatrics, the team looked at 71 children between ages six and 12 who had been diagnosed with ASD. Researchers programmed the app with Google Glass to teach participants about facial expressions with real-time cues. First, when a face is detected by the glasses' camera, an emoji appears in the display corresponding with the emotion.